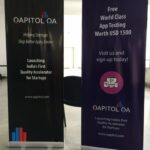 On the 9th of July, the 100th edition of an incredible community meetup – Startup Saturday Hyderabad – was celebrated at IIIT-H. This celebratory edition was packed with multiple panel discussions, startup pitches, live music, startup spoof, Zumba etc. The celebratory seminar had a featured panel on “Next Gen Early Stage Funding -A discussion on how investor considerations are changing”, that had Sashi Reddi of SRI Ventures (earlier founded AppLabs), the popular and multi-faceted Ramana Gogula, Suresh Reddy of Lycos Group (founder of Ybrant Digital) and Sateesh Andra of Endiya ventures. The keynote talk was delivered by Sri Jayesh Ranjan, Secretary IT&C Dept Gov of Telangana, where he shared the vision of the state government in fostering and accelerating the startup support and enabling ecosystem in the city. This was followed by 3 other panels- “One Saturday, a crore and now this! Super entrepreneurs sharing their SS experience”, “Startup Workspaces that Click. Coworking spaces bringing in that unique enablement” & “Press that accelerator. Programs that help startups grow and growth-hack”. 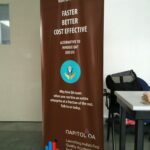 Speaking at the seminar, Sashi Reddi said “Startups have to look for differentiation and customer acquisition first and fund-raising next”. 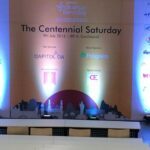 Amit Singh, one of the 16 founders of Headstart network and presently the National head said “Am Very happy to see Hyderabad celebrating the centennial Saturday, just 2 months after Bangalore. Hyderabad is rapidly growing to be a very vibrant early stage startup destination in the country”. 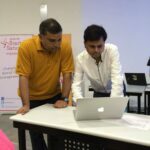 Ramesh Loganathan from Hyderabad is one of the 16 founders and along with Srikanth Soni helps lead the Hyderabad startup meetups and activities from Headstart.